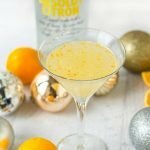 This low carb lemon drop fizz is the perfect drink for the holidays. It's bright and refreshing and very easy to make. You can make it with or without alcohol and each drink has only 1.7g net carbs! In a shaker cup add the juice, vodka, sweetener and zest. Mix well and pour over ice. Add seltzer water to fill the rest of the glass. Taste and adjust accordingly. If you don't want the zest in your drink: either eliminate it OR mix the juice, zest and vodka ahead of time and refrigerate until ready to use. Then strain before finishing the cocktail with the sweetener and seltzer.